Large inventory of Fanuc Alpha Series All Versions Available. Machine down, need a Fanuc Alpha? Fanuc 7 segment display Alarms. Fanuc Alpha Alarms reference to Fanuc drives that begin with part number A06B-6079, A06B-6080, and A06B-6096 type SVM1, SVM2, SVM3 FSSB and is meant to help troubleshoot Fanuc alpha drive faults. If a drive status alarm appears on the 7 segment display, where the "-" refers to drive not ready (Waiting for an Emergency Stop signal to power up) and "0" refers to servo drive powering up correctly. Any other number or letter on this status display is an alarm code. One of the more common faults is an Alarm 8.dot below is the alarm codes and their meanings. 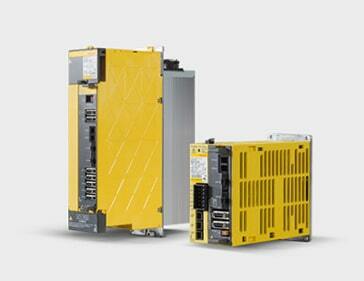 Save Money, our Fanuc Alpha Drives are at Least 50% Below the high Manufacturers Prices. We are an Independent Fanuc Spare Parts Specialist. We are not affiliated to Fanuc uk, Fanuc Ltd or GE Fanuc. © Pennine Automation Spares. All rights reserved. We are an independent Fanuc Alpha Specialist.